Black, Gold and Bronze options reinforce contemporary aesthetics within a variety of color schemes. Kohler Co., a global leader in kitchen and bath design and technology, introduces an array of new finish options for its Karbon kitchen faucet, which was introduced last year and has already achieved iconic status within the design community. Now available in Black with Polished Chrome or Vibrant® Stainless joint accents, Gold with Vibrant® Brushed Gold or Vibrant® Polished Gold joint accents as well as Bronze with Vibrant® Brushed Bronze joint accents, Karbon’s unique visual allure reinforces contemporary aesthetics and is now adaptable within a variety of color schemes. Unprecedented functionality and ease of use serve as the inspiration for the Karbon articulating faucet’s unconventional, modern design. It has all the versatile mobility of a pull-down faucet, but unlike pull-down faucets, the five pivoting joints of the Karbon faucet allow the user to precisely position the water stream and then have both hands free. This truly unique hands-free feature is what sets this faucet apart from other faucets, leaving the user to easily multitask, thereby increasing productivity in the kitchen. The Karbon faucet gets its name from the surprisingly lightweight, yet incredibly strong material of which it is partly comprised. The original design impetus of the Karbon kitchen faucet was inspired by lighting and construction equipment with articulating joints. The faucet was originally launched in Silver with Polished Chrome and Stainless. Additionally, the faucet offers both spray and aerated water flow options, eliminating the need for a sidespray. An elaborate design detail is featured in the remote joystick valve that consists of two disks of identical size installed flush with the countertop to provide an unusually sleek look and offer easy cleaning. All finishes are available in deck- and wall-mount models. 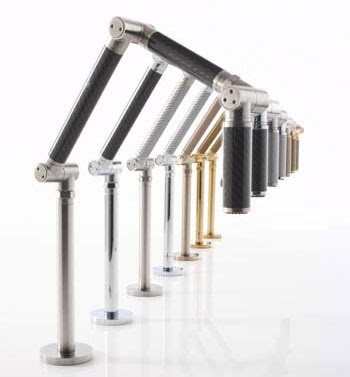 The actual construction of the faucet is a combination of traditional brass and innovative carbon fiber composite tubing. The logic behind the use of carbon fiber lies in its superior strength and light weight, allowing for tight movement tolerance and the exceptional functional performance of this faucet. 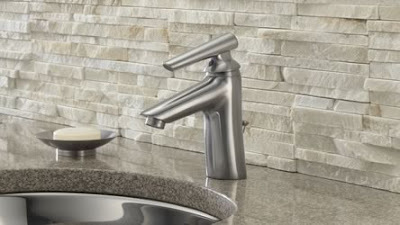 The joints connecting the four sections of the faucet employ a novel patented technology that provides exceptional resistance to support the spout while allowing for smooth and effortless handling. What is the difference between a Moen PosiTemp valve and a Moentrol Valve? First we look at the similarities of the two valves. Both offer a pressure-balanced system that maintains water temperature within two degrees. Built-in temperature limit stops which all you to control how far the handle rotates, therefore, controlling the range of water temperature. Available in a variety of connections from common 1/2" CC/Sweat, 1/2" IPS threaded, 1/2 PEX or CPVC. Meets pressure-balancing safety codes. Now we look at the differences between the two valves. The Moentrol has Temporature Memory. When shutting-off the shower faucet, the handle stays in the exact temperature position you set during use. The next time you turn on the faucet, within a few seconds, the water temperature reaches your last temperature setting. The PosiTemp doesn't have Temperature Memory. The handle goes from one side to the other always going from cold to hot from the off position. The Moentrol Valve has volume control which controls the water flow rate so you get the amount of water you want at the temperature you desire. The Moentrol has a flow rate of 7.5gpm while the PosiTemp has a flow rate of 6.3gpm. The Moentrol valve operates by pulling the knob out to control flow. Once the knob is pulled out to turn the water on, it is then rotated to select a temperature. Left for hot, right for cold, or a mixture of both in the middle. Once the faucet is done being used, you can turn it off by pushing the knob straight in. The PosiTemp valve does not pull out. To turn on the water flow the handle is rotated counterclockwise. You turn the handle counterclockwise until water dispences. The water starts at the coldest setting. To change to a higher temperature you keep turning the knob counterclockwise. All the way counterclockwise would be the hottest temperature setting. To turn the faucet off turn it all the way back clockwise to the off position. The Moentrol valve is more expensive then the PosiTemp for the added feature of Temerature Control where you can set the temperature so it is always where you like it. Check out the Moentrol valve and PosiTemp valve by Moen Faucets. Brought to you by The Faucet Expert (TM). Videos. Shower Valve With Stops, What Does That Mean? Shower Valve Options, What Is Behind The Wall? For the sophisticated consumer seeking a contemporary styled product with clean design, Delta® introduced the Zen-inspired Rhythm® bath collection at the 2009 Kitchen and Bath Industry Show. The sleek, fluid lines of the design help turn the room into a serene retreat, enhancing tranquility in the bath. “In addition to its tranquil design, Rhythm also offers significant water-saving benefits,” said Justin McCarthy, Delta associate product manager. “These WaterSense® labeled lavatories provide more than 30% water savings without sacrificing the comfort and convenience of the user experience or the durability and life span of the product.” They flow at 1.5 gallons per minute (gpm) at 60 pounds per square inch (psi) versus the industry standard of 2.2 gpm. (ASME.A112.18.1/CSA.B125.1 of 2.2 gpm). Visit www.deltafaucet.com/company/green for more information about WaterSense labeled products. Rhythm’s current product offering features the first Delta wall-mount lavatory faucet that follows the trend toward vessel sinks in the bathroom. The wall-mount is available in Chrome and Brilliance® Stainless and features a push button pop-up. This suite also offers a three-function showerhead that creates a customizable shower experience with soft-aerated, massage or full spray options. In addition to the three functions, this showerhead has the exclusive Touch-Clean® Technology, which incorporates rubber nubbins that permit easy wipe-away of calcium and lime from the spray face of the showerhead or handshower with the touch of a finger. The Rhythm suite will see a mid-year 2009 expansion with the addition of a new tub spout, a 14” shower arm and 8-3/4” raincan showerhead, which will deliver an improved showering experience as well as feature the exclusive Touch-Clean Technology. Rhythm accessories, faucets and showers in Chrome and Brilliance Stainless create a clean, minimalist look throughout the bath.